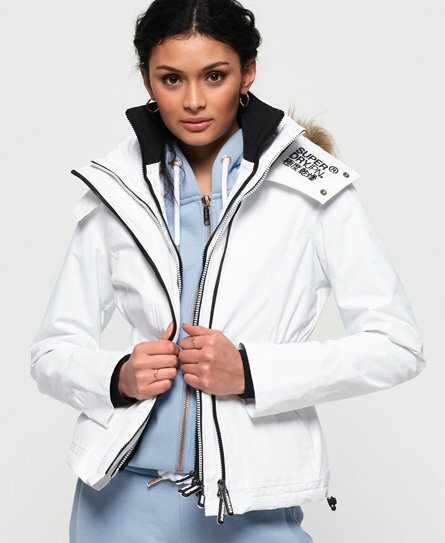 Superdry women's hooded faux fur Winter SD-Windattacker. Part of the iconic wind family, featuring a triple layer two-way zip fastening, a bungee cord adjustable hood with a faux fur trim and thumbholes in the cuffs. This jacket also features a bungee cord adjustable waist and hem for the perfect fit, a cosy fleece lined body and two front zipped pockets. The hooded faux fur Winter SD-Wind Attacker is completed with a Superdry logo badge on the sleeve. Wear this jacket over any outfit for an extra layer of warmth.